Reviewers are usually the academicians/clinicians /researchers/ health administrators, who have keen in the subject area of the manuscript under consideration of Review. 6-11 reviewers are usually identified for every manuscript and invited for reviewing the manuscript. A copy of abstract is also supplied to the invited reviewers. On the bases of abstract and the Reviewer can accept or reject the offer/invitation. The reviewers are encouraged to send their detailed comments on the manuscript and also their initial decision about the publish-ability of the manuscript. On the basis of comments obtained editor invite the author to revise the manuscript. Reviewers are invited to re-review the revised manuscript, if they wish so. All the reviewers are communicated with the final decision arriving on the manuscript they have reviewed initially. Reviewers are also required to declare their conflict of interest if there is any referring to the manuscript they are invited to review. The following is the Editorial and Review workflow that every manuscript submitted to the journal undergoes during the course of the peer-review process. The entire editorial work is via an advances but user friendly “ Online Manuscript Review, Revision and Online publication System” . 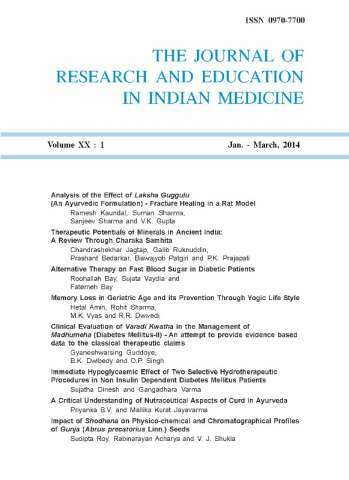 Once a manuscript is submitted online using SUBMIT ARTICLE link of our new website https://www.jreim-ayushjournal.com . First-time Authors/Users: Please click on the word "Register" in the navigation bar at the top of the page and enter the requested information. Upon successful registration, you will be sent an e-mail with instructions to verify your registration. If you could not see email in your inbo, please do not forget to check spam/junk folders. NOTE: If you received an e-mail from us with an assigned user ID and password, DO NOT REGISTER AGAIN. Simply use that information to login. Usernames and passwords may be changed after registration. Repeat Authors/Users: Please enter your username and password in the box above and login to the system. If you have additional roles in this or different journals, you could change your status after login to system. Authors to enter username and password in the provided box and login to the system. Author may then submit new manuscript and track its progress through the system. A. The online submitted manuscript is checked by the journal’s editorial office to ensure that it is suitable to go through the normal peer review process. B. The accompanied obligatory documents are also checked and the ID of authors is also seen at journal’s editorial office. Once this is done, each manuscript is sent to an appropriate Editor based on its subject area. All manuscripts shall be handled by an Editor who does not have any potential conflict of interest with any of the manuscript’s authors. Further, if the assigned Editor finds that the submitted manuscript is of sufficient quality and falls within the scope of the journal, a number of external reviewers, provided that no conflict of interests exists between these reviewers and the manuscript’s authors. The reviewers can opt if they would like to see the manuscript again after revision. The corresponding author is conveyed the observations of each reviewer and authors are expected to normally re-submit their revised paper within one month. When all reviewers have submitted their reports, the Editor usually “Send the revised manuscript for post-revision check” to the same reviewers. If the Editor recommends “Publish,” the manuscript will undergo a final check by the journal’s editorial office in order to ensure that the manuscript and its review process adhere to the journal’s guidelines and policies. Once this is done, the authors will be notified of the manuscript’s acceptance, and the abstract of the article / paper will appear in the “Online First section” of the journal’s website, if so opted by the author. DOI assignment fee is born by authors after the acceptance of paper. If the Editor recommends “Publish after Minor Changes,” the authors are notified again to prepare and submit a final copy of their manuscript with the required minor changes suggested by the reviewers. The Editor reviews the revised manuscript after the minor changes have been made by the authors. Once the Editor is satisfied with the final manuscript, the manuscript is accepted. If the Editor recommends “Publish after applying my corrections” the authors are expected to revise their manuscript again, in accordance with that recommendation and to submit their revised manuscript in a timely manner. If the Editor-in-Chief decides rejecting the manuscript, the rejection is immediate. The editorial workflow gives the Editors / Editor-in-Chief the authority to reject any manuscript because of inappropriateness of its subject, lack of quality, or incorrectness of its results. The Editor cannot assign himself/herself as an external reviewer of the manuscript. This is to ensure a high-quality, fair, and unbiased peer-review process of every manuscript submitted to the journal, since any manuscript must be recommended by two or more (usually three or more) external reviewers along with the Editor in charge of the manuscript in order for it to be accepted for publication in the JREIM. The peer-review process is double blinded; that is, the reviewers do not know who the authors of the manuscript are and the authors also do not have access to the information of who the peer reviewers are. An acknowledgment letter for the researchers who have performed the peer-review process for one or more articles/research papers/ manuscripts is issued to each Reviewer by the Editor-in- Chief / Chief Editor/ Editor, who realize that without the significant contributions made by the Reviewers (Academicians and Researchers), the publication of the JREIM would not be possible. Peer reviewers have great value in providing credibility and authenticity to any Research Paper / review article and JREIM understands it well. We attach great importance to it. JREIM values the timely publication of all scientific and credible manuscripts submitted for publication, so it is important in the interest of author their research papers / manuscripts are reviewed by the appropriate reviewer, who is expert of the field to which that manuscript belongs. It not only furthers the authenticity of the Research Paper / review article but also helps in shaping the manuscript in minimum time with maximum output. Generally, reviewers are asked to return their comments within one week - online. REVIEWERS are requested get registered online as reviewer and to fill all the information about your intersts helping JREIM - for the appropriate selection of peer reviewers. Yor registration online -as- REVIEWER allows JREIM to recognize your specific field of expertise and facilitates the selection of appropriate peer reviewers for specific manuscripts.